If you’re not familiar with the Calvin and Hobbes comic strip series by Bill Watterson, then for starters, you should probably try to be a little more cultured. Still, I’ll do you the favor of summarizing what the strip is about. Calvin is a young boy (think second grade) who, for whatever reason, has a mischievous streak a mile wide and the strange ability to consider some of the grander concepts of human nature. This doesn’t help his behavior or the process of maturation at all, but it does give us a unique glimpse into the as-yet-unfiltered mind of the childish nature that exists within us all. Hobbes is Calvin’s mind reacting to itself. At least, that’s my interpretation. The characters are organic enough that one simple structure isn’t enough to actually encapsulate the full extent of the comic strip’s meaning. However, it certainly doesn’t hurt to put that lens on it either. Here we see the genius of the comic strip coming alive. Calvin, having somehow grasped concepts (and their concomitant phrases) of moral structures and socio-political models of thought, raises a point only for Hobbes to put it to the test. The kickback that Hobbes offers isn’t one of calculated rhetoric or measured logic. Instead, it’s revealed in action, in Hobbes’ behavior. But more often than not, Hobbes’ reaction to what Calvin does isn’t about contradicting him in some fashion. Often, Hobbes just lets Calvin be, and Calvin, unaware that the reader is capable of seeing what Hobbes is doing, ends up exhibiting for us the foolishness of humanity. Sometimes this means that Hobbes is just a sounding board. Sometimes it means that he offers commentary (which may or may not be secretly intended for the reader), and sometimes he simply responds how a normal human would respond. Hobbes is joined by Calvin’s parents in acting as a foil for Calvin’s often outrageous behavior. And they behave as parents often do when confronting the destructive, unformed psyches of their children. They get angry, frustrated, and downright exhausted at times. However, they too, by their reactions, help to highlight the often-broken human nature that seeps through in Calvin’s escapades. Hobbes and Calvin’s parents together work to frame Calvin’s behavior in such a way that the nature of humanity is exposed. Ah, but what is the “nature of humanity” that this comic is supposedly trying to illuminate for the reader? It might help you to know where the names Calvin and Hobbes come from. 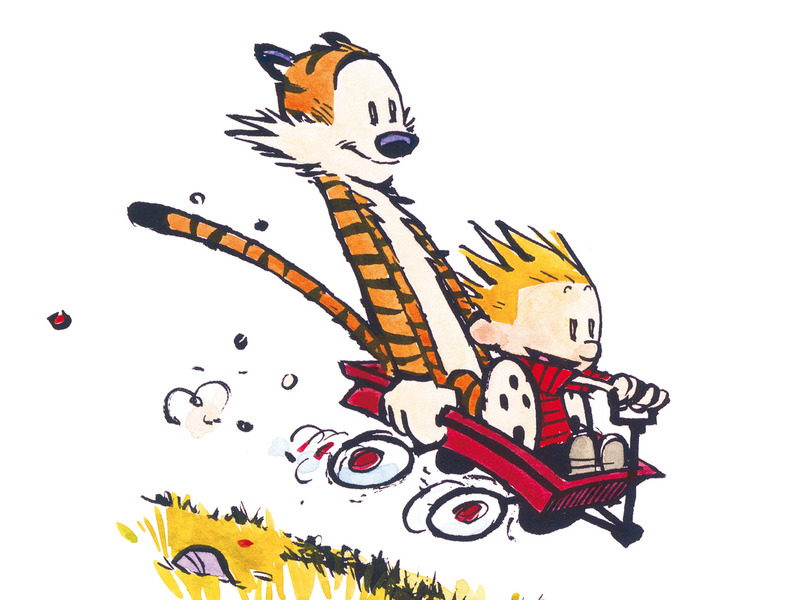 Perhaps you had some suspicions, or perhaps you already knew, but either way, Calvin and Hobbes are named after John Calvin and Thomas Hobbes. So what does that mean? John Calvin, a famous theologian during the Christian Reformation period, and Thomas Hobbes, a political and philosophical thinker during the Enlightenment (he was born just a few decades after John Calvin died), are both known for taking a less-than-positive view on the base nature of humans. For both of them, humans, if given over to their natural devices, would be terrible and utterly unethical. “Sinful” is the word Calvin would use. If we operated based on how our nature dictated we ought to, we would be nothing more than roving, war-mongering people, trusting only ourselves and trusting others only insofar as we could keep an eye on them. For Calvin, the reason for this is because of the Fall of Adam and Eve. Adam and Eve both sinned before God, and so they became, as the "T" in Calvinist TULIP theory postulates, Totally depraved. Humans are therefore prone to behave in ways that are just plain evil, their being created in the image of God notwithstanding. For Hobbes, a different logic is used, but the same conclusion is reached. Humans, despite having logical powers far above those of animals (in a quantitative, if not qualitative, way), do not behave nicely. We kill, we steal, we cheat, we hurt, we destroy. And even if we can use our minds to better our current situations, we ultimately have selfish goals in mind. Think of The Hunger Games. Even though all those kids are smart and clever, they’re not interested in getting along, and even if they are, it’s only temporary. 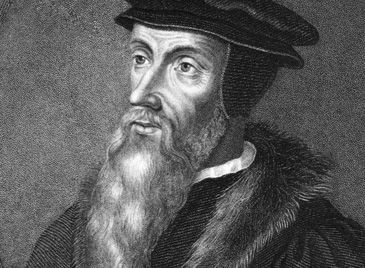 Now, for John Calvin, salvation through Christ is the solution to the human condition. For Thomas Hobbes, civil society is the answer: we make laws we can agree on to combat our otherwise selfish impulses. Regardless of the cause of or the solution to the problem of human nature, the boy Calvin is clearly afflicted with the human condition. He is often either indulging in or paying for his selfish behavior. Nearly every comic shows Calvin in some way wrestling with the internal conflict between the expectation that he behave properly and the impulse, as a child, not to. But there is a different sort of comic that arises every so often within the narrative. Occasionally, Calvin, with his precocious mind, becomes aware of himself and his existence within the grand scheme of things. This, perhaps, is what connects the comic to the above mentioned figures more than anything. There are times in which Calvin becomes aware, even if only for a fleeting moment, of the struggle he is in. The best example of this is probably the picture below. In this strip we see that Calvin, for all of his immature impulses, becomes aware that he is not only not the center of the universe but that he is also a very small part of it. His natural bent to follow his ego is nothing compared to the knowledge that there is more to life than his ego. It is this lesson that Calvin and Hobbes teaches the best. While it is easy to see the ways in which Calvin and Hobbes display the human condition, it is perhaps more important to see that Calvin and Hobbes is, in the end, about reconciliation. Calvin’s greatest task isn’t getting himself to behave, and Hobbes’ greatest involvement isn’t finally enlightening Calvin. Rather, Calvin’s struggle--"journey" is a better word--is to see why he ought to behave. We know that Calvin will always struggle with this because we always struggle with this, but at the same time, we know that the better perspective to have is not one of trying to dominate the baser desires, but instead to see that life is bigger than oneself. To fight oneself is, ultimately, a losing battle. Even if you win, you’ve only won to a different you. The better fight is to let go of one’s own importance. Let the grander picture of things be the victor and, in a paradoxical, Hero’s Journey sort of way, you’ll be the winner. Now, what kind of philosopher would I be if I didn’t suggest that there’s more to the story? Of course there is; I might not have the right lens to find it, but let’s not reduce Calvin and Hobbes to a mere parable. Look for your own wisdom. At the same time, it might not hurt to think of Calvin and Hobbes as any literary critic might: two characters showing us ourselves. What do you get out of Calvin and Hobbes comics? What other comics do you find depict human nature especially well?